Although many fruit trees do well in full sun, some dwarf tree varieties can grow and and produce fruit in partial sun. Partial sun is defined as three to six hours of sunlight per day. Some dwarf trees, like Meyer lemon, are naturally small; others are grafted to dwarf root stocks that limit their size. If your dwarf fruit trees are in areas colder than the recommended climate zones, you can grow them in pots for easy transport to protected areas during cold weather. Lemons can grow well in partial sun, but their fruit harvest will be reduced. True lemons grafted on dwarf root stocks can grow and fruit in partial sun. True lemons are the most acidic and sour of the citrus fruits. Meyer lemons are a cross between an orange and a lemon that originated in China. They were first observed by westerners in 1908 near Beijing. Lemons can be sensitive to cold and thrive outdoors in USDA Hardiness Zone 9b and warmer. Lemons can be damaged if left out in temperatures below 25 degrees Fahrenheit. If you live in a colder zone, you can grow dwarf lemons in containers. Simply move the lemon trees indoors during cold weather. A number of dwarf oranges grow well and produce fruit in partial sun. As with lemons, the trees will grow well, but fruit production won't be as high. Satsuma orange trees are naturally smaller, growing to a maximum of 5 feet high and wide. Like lemons, they are cold hardy to 25 degrees Fahrenheit. They should be grown in containers above USDA Hardiness Zone 9b. And container-grown trees should be brought inside if the temperature falls below 25 degrees Fahrenheit, according to Texas A&M University. Other orange trees grafted to dwarf root stocks can also grow well in partial sun, but they also will have reduced yields. 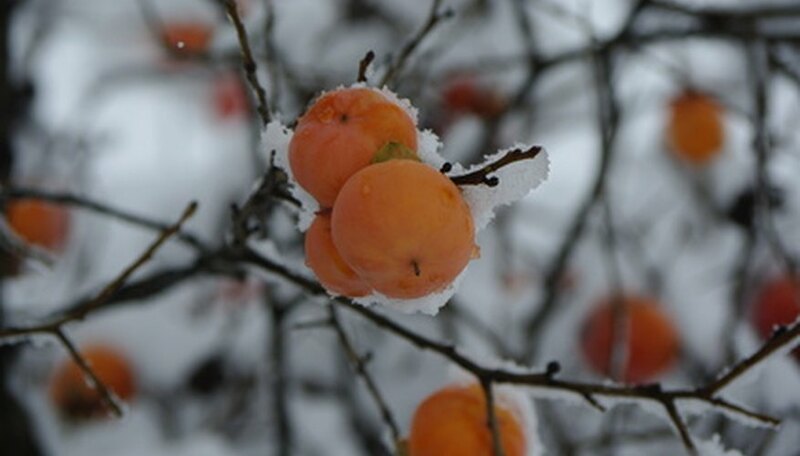 According to Purdue University, there are a number of dwarf and semi-dwarf persimmon trees, including the Nightingale variety. Persimmons can be grafted on dwarf root stocks. Louisiana State University suggests that persimmons do best in partial sun or partial shade. The persimmon fruit can range in flavor from flat and astringent to sweet, depending on the variety. Virginia Tech lists persimmons as growing well in USDA Hardiness Zones 5 through 9. Persimmons can grow in pots in climates colder than USDA Hardiness Zone 5. How Much Sun Does a Eureka Lemon Tree Need?